Vegan picadillo from Eat Like a Yogi—even better than the real thing. Peccadillo and picadillo. One a minor fault, the other a major yum. Guess which one we’re talking about today?! Picadillo, the major yum, is generally considered to have originated from Spain and Latin America, but nearly every culture has something like it. 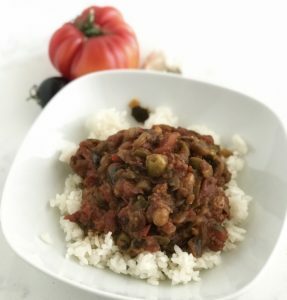 Building on the familiar base of sofrito—garlic, onions, tomatoes, and vegetable oil—picadillo veers into Latin territory with the addition of Sazon seasoning, which is a spice blend of cumin, coriander, and several other ingredients. Typically, picadillo is made with ground meat. So, how to veganize it? Then I noticed recently when I roasted an eggplant how soft it became. Eggplant works well with other nightshades, and since it doesn’t have a strong flavor, I figured it would absorb the seasonings nicely. Does it ever! Other highlights of this dish are olives, capers, and raisins. Yes, raisins! After simmering for an afternoon you can barely spot them in the stew, but they impart a surprise sweetness that balances the intensity of this dish nicely. The olives and capers lend saltiness and depth, which highlights the acidity of the tomatoes. This picadillo is incredibly flavorful, and unusual but familiar at the same time. The recipe also makes a large quantity, so it’s a good dish for company. Just make sure you keep some leftovers—picadillo is even better the second day. or eat it like a stew with tortilla chips. Add the onions and cook until they become somewhat transparent, around 5 minutes. Add the cubed eggplant, diced peppers, sazon seasoning, and salt; stir well to combine. Cook, covered, around ten minutes, stirring occasionally. Add all of the remaining ingredients: garlic, raisins, olives, capers, tomatoes, and apple cider vinegar. Bring to bubbling, then turn the heat to low and simmer, covered, for at least two and up to four hours. Half an hour before you’re ready to eat, prepare the rice. Simply use coconut water in place of regular water and continue according to package directions. When the rice is finished cooking and steaming, fluff it with a fork and serve under the picadillo.